While I should probably work from oldest to newest in catching up with my cakes and sweets, I cant help but to post a cake from just a month ago. It is the grandest cake I’ve ever made, I am still in awe of it! 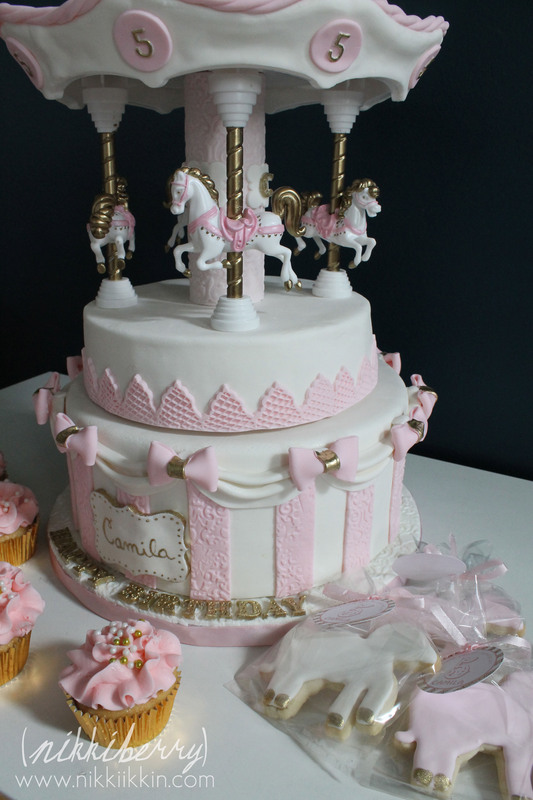 My client was a former neighbor that admits a frou frou cake wasnt her style but fell in love with some of the magical & dreamy carousel cakes on pinterest. 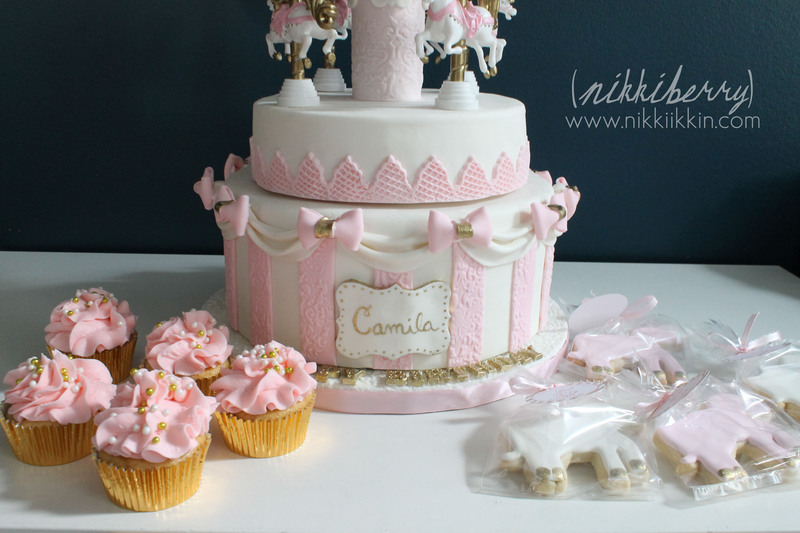 It didnt take much convincing for her birthday girl to choose this pink and gold style when she showed her some examples. 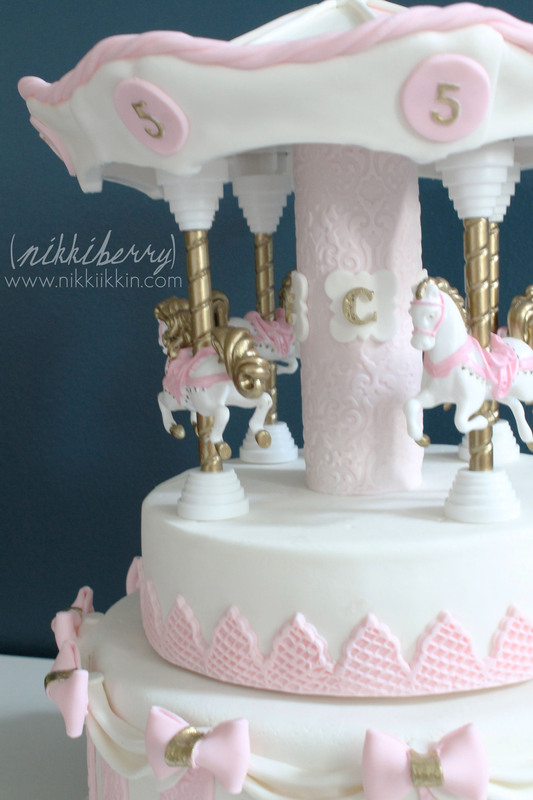 A carousel cake was on my wish list of to-dos so I was so ready for it! 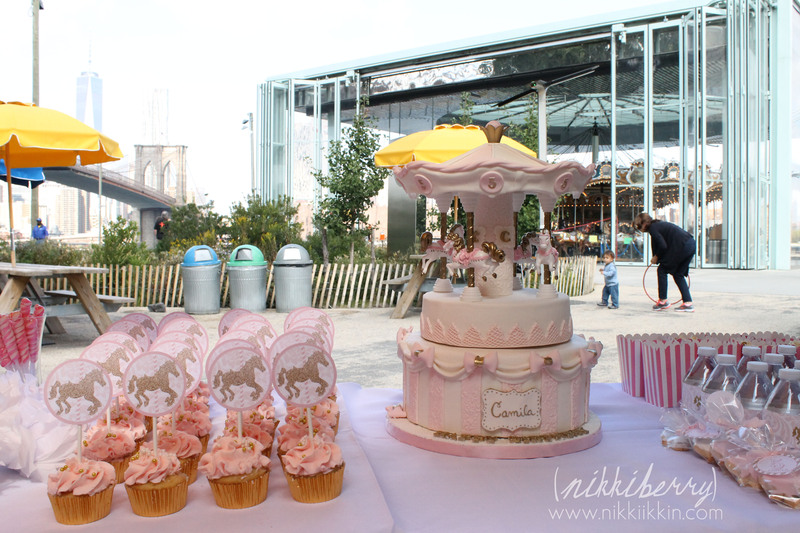 This party was at Jane’s Carousel in DUMBO, Brooklyn, now a must see and do part of NYC. The top tier of this cake was not edible. 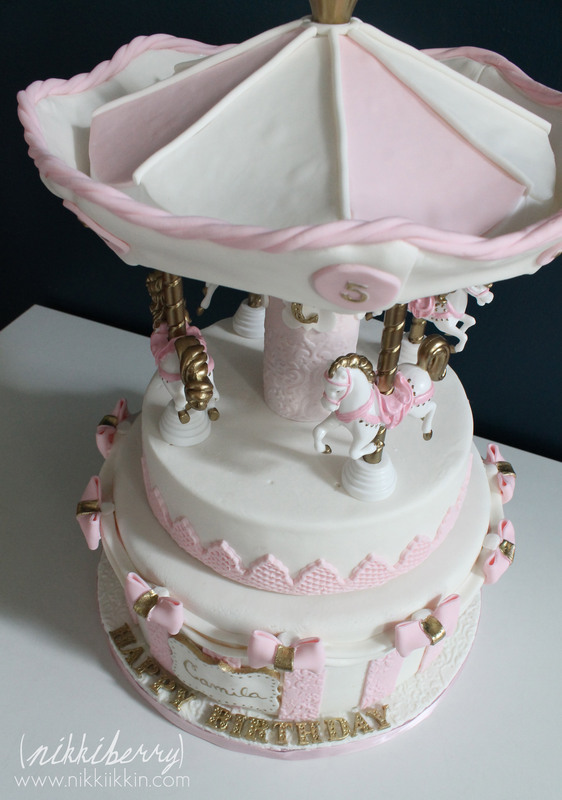 Macy and I came up with a hack to Wilton’s carousel cake kit that ensured I wouldn’t have stress or failure with the plastic horses, poles and carousel top. Wilton’s kit by itself is just asking for trouble. 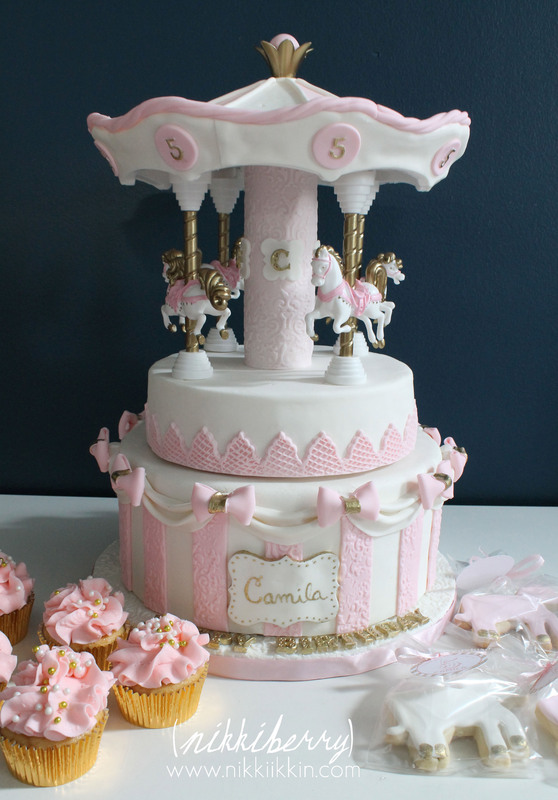 I could only see disaster happening by using it the suggest way, which is to sink the 4 poles into your cake and set, without any fixation, the carousel top onto the poles. WHAAAT? As a user of Craftsy classes and a fan of Jessica Harris Cakes I decided to use what I learned from Jessica’s Cakes for Kids class and combine that with Wilton’s kit. Mainly, I added a PVC pipe center idea. This made a huge improvement to the stability. I also premade this topper using a stryofoam dummy as the base to sink the PVC pipe and horse poles into (its easy to find 24″ pipes to cut down with a small hack saw at Lowes). 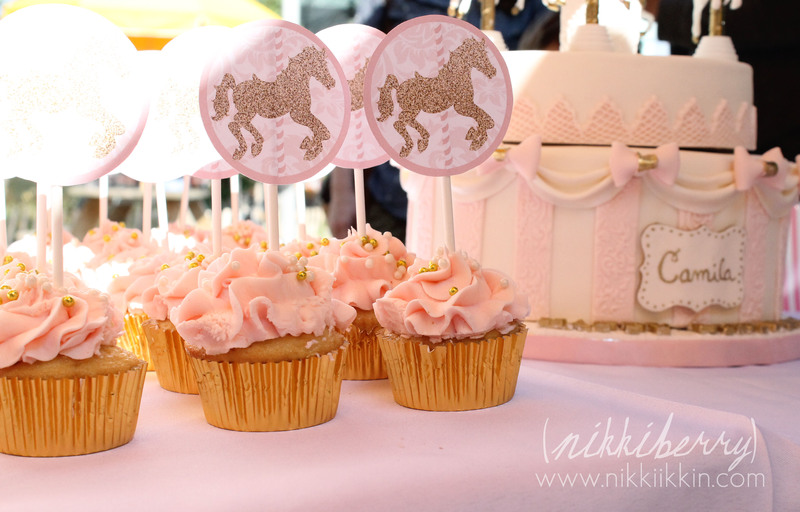 The one other hack I made was to use a cardboard cake board round with holes for the poles and PVC pipe under the carousel top as a placeholder for keeping everything in line. All of this hacking took planing and time to execute. 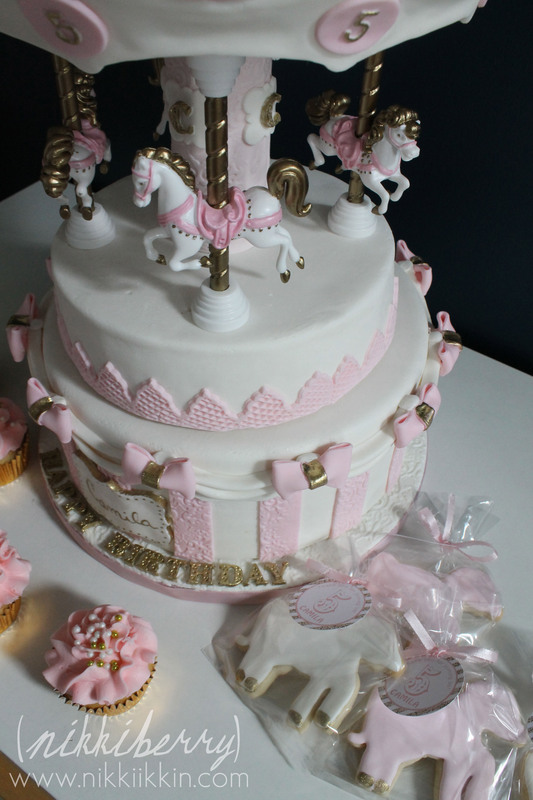 Im glad I took my time well before I was in baking mode to create the topper and I was ecstatic at how easy and secure this set up was when I finished! To assemble it with the cake all I had to do was set it in place. When the party was over it all came back apart and went back in the kit box (including my additions). I used non edible paint on the horses and poles. The rest of the decorations on the topper are fondant but not meant to be consumed. Hopefully, if I use this set again it will be another pink and gold cake, otherwise I’ll have to experiment repainting with some really good quality paint. This bottom tier of the cake was 10″ and for me that is HUGE! I do believe I have overcome a few of my fears doing this cake. First of all making a cake that big was not often a client request. 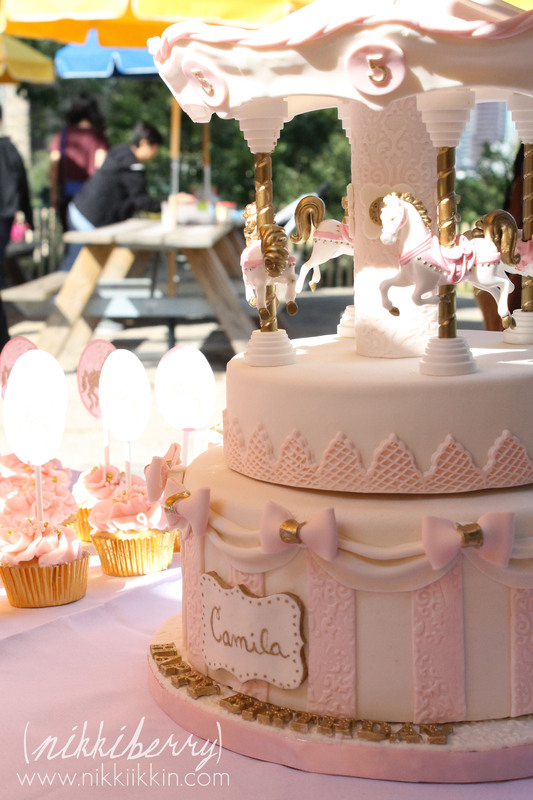 I typically get asked for 8″ +6″ which is a great size for birthday parties. Or I make the bottom tier a fake 10″ + real 8″. 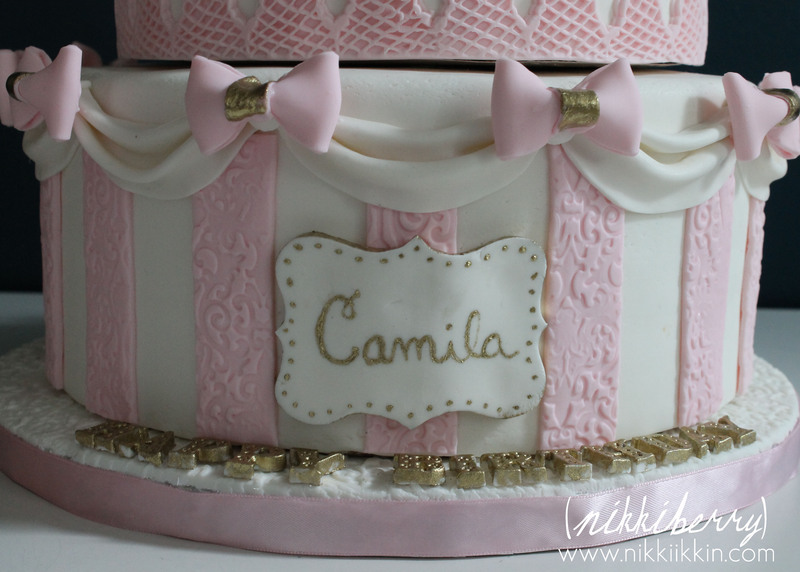 But because the Wilton kit only fit 8″ or larger cakes I had to go up on the bottom tier. The other fear I’ve always had is delivery, which in NYC is a nightmare. 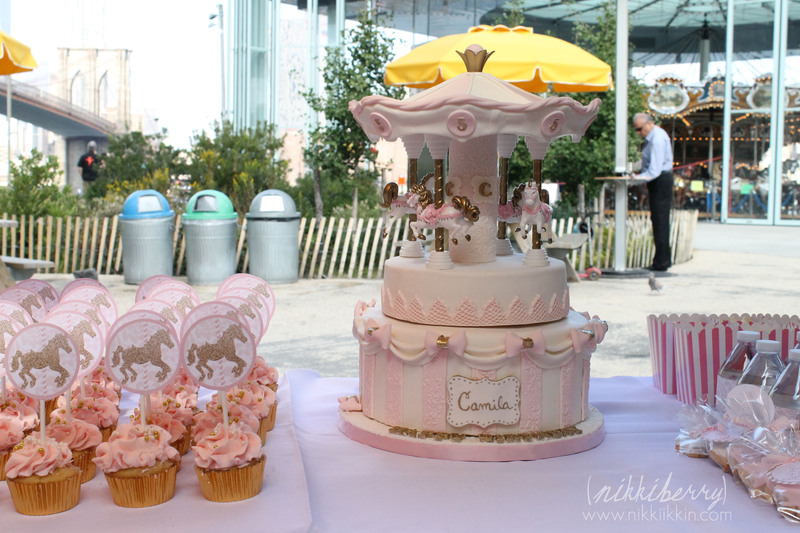 You are never more aware of every pot hole in Brooklyn as when you deliever a cake! But I have found that refrigerating a cake (even though many cake decorators dont condone putting a fondant cake in the fridge) is the only way to ensure the least possible shake, shift and buldge during a car ride. 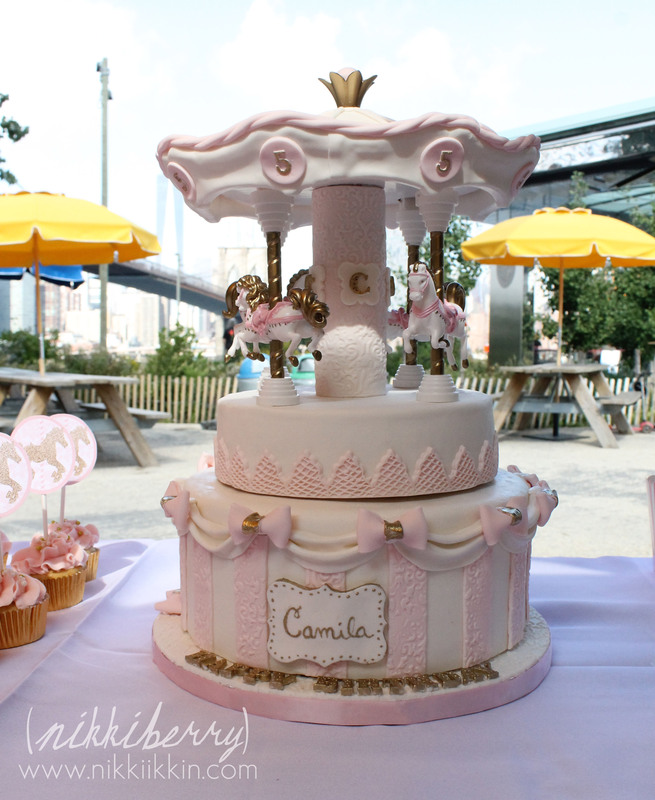 This one was perfect when I set it up at Jane’s Carousel and I was told still without any flaws when they cut and served it about 2 hours later. YESSS thats what I want to hear! 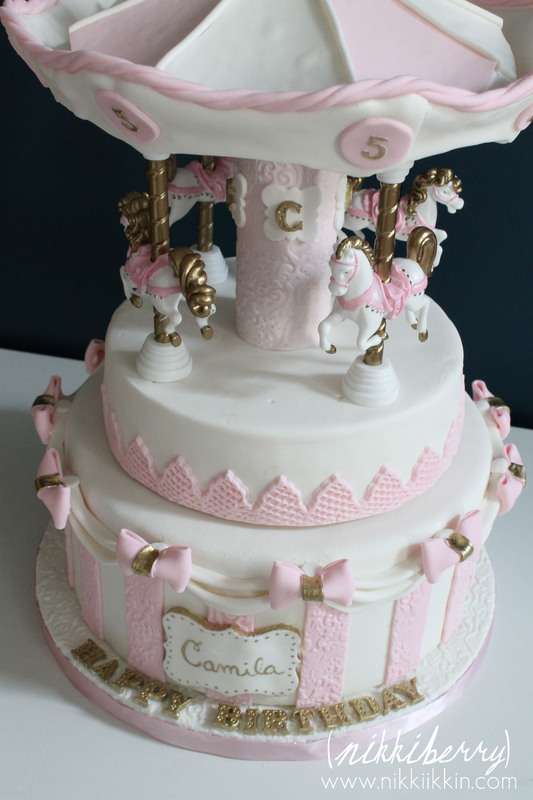 The kids and parents as well as my clients LOVED this cake! The children in particular were in awe. I feel like Santa unpacking his bag of gifts as I set up my tables, the kids always surround me and ask all kinds of questions. Kids are always curious of fondant, they want to touch it right away. I never mind letting them; poking their little fingers into a birthday cake is like a tradition. But they dont really know what to think of this hard icing, “what is it?” is what I hear most. I tell them is like play doh but made of sugar. “how did you make this?” is the other I hear, “with lots of practice” is the shortest answer I can give them! I was told after the party that the kids refused the cupcakes that were intended for them. 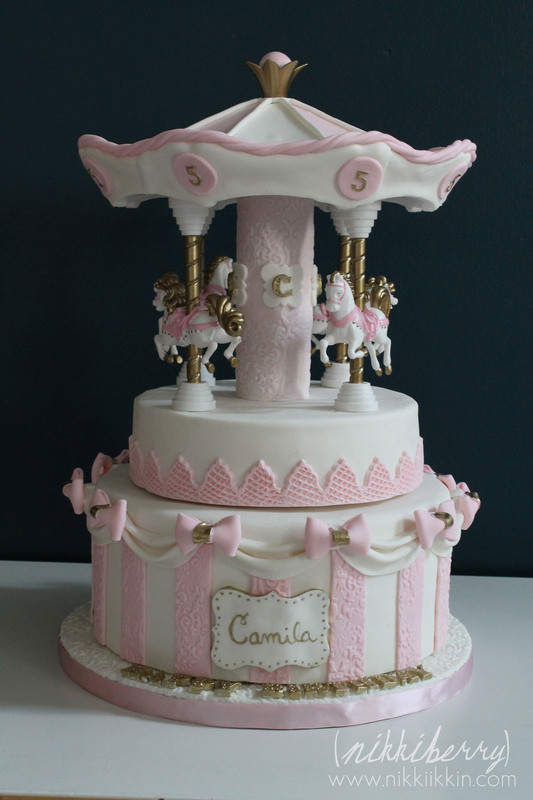 They all wanted a piece of that carousel cake! Having my cakes in public view is a great, I love the feedback and kind remarks from passerby’s. 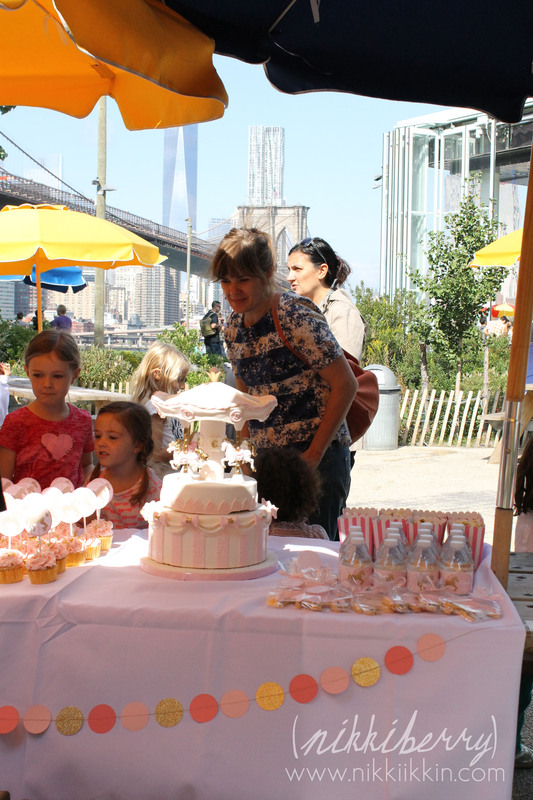 This is the second party I have done at Brooklyn’s new riverside parks. It’s not an easy one to plan for the hostess (but so worth it) as the tables are first come first serve. Getting there early is the key, the park gets hoping by 10am so if you are planing a party at Pier 6 or Brooklyn Bridge park definitely get there before 9am to snag a table. I also made the cupcakes and cookies for this party. I often get asked for combos like this for parities: cupcakes for the kids, a smaller cake for the adults and cookies as take home favors. When a client is interested in taking the aesthetic of the party to the next level, I more than welcome their questions and freely give suggestions for resources and my tricks for table design. 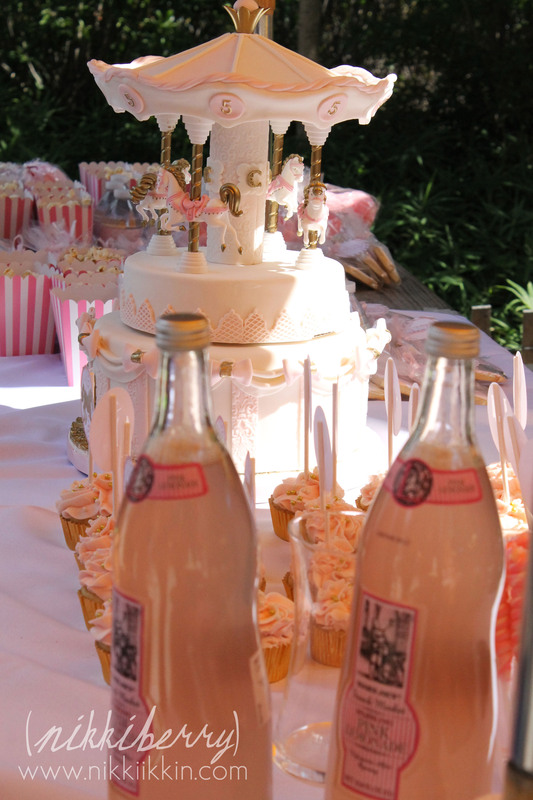 This included service when ordering sweets with me works well as the client is hands on in gathering and assembling decorations for their table and I get to see my cakes and treats surrounded by a well thought out table design. I also enjoy the collaboration with creative and excited hostess that are passionate in celebrating the special people in their lives. I also offer full service design and installation of desert tables with the same creative passion for aesthetics and sweet treats but without any work for the hostess on the day of the event. Either way full service or collaborations with clients makes me one happy girl!